It’s been a whirlwind tour. Sunday, friend Jo came to see us. Monday, we went to Oxfordshire to see friend Tania and her two little girls aged 3 and 5. Tuesday, we went to Berkshire to see friend John. Tuesday evening, we went to another bit of Berkshire to see friends Sarah, Richard and their twin boys aged 5. Wednesday we went to Colchester to see friend Faith and her prayer group, and Wednesday evening we went to Dovercourt to see friends at Kingsway Evangelical church. Joni of course loves all the attention. It’s a good job he still needs his parents to drive him places, otherwise we’d probably be superfluous to requirements. We have also enjoyed ourselves catching up with lots of friends, and we were also encouraged by the warm response we received at the two meetings that we took. I was thinking last night that giving presentations to groups is a bit like crowd-surfing (you can tell the kind of gigs I used to go to as a student); person throws themselves onto the mercy and the upstretched arms of the crowd, who bear said surfer aloft, passing them to the back of the arena and safely restoring them to earth. Sometimes it went wrong and people got hurt, but that was part of the risk, and I never actually saw it happen in all my gig-going experience. So, we threw ourselves on the mercy and the upstretched arms of our supporting groups. The church at Dovercourt have gone technical since we were last there, but unfortunately we couldn’t make our laptop talk properly to their beamer. So after a lot of fiddling by us, and patience from the church, we had to set up our (borrowed) beamer and use that instead. Having finally begun the meeting, I was disconcerted to see Martin exit with Joni and the nappy bag just at the end of my talk, when Martin was supposed to come to the front and do his bit. 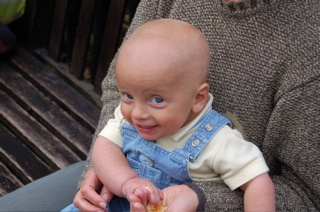 I swiftly moved into a time of “any questions?” but there are limits to the stringing along that one can produce, so I made my excuses, and leaving the stage empty, went to swop with Martin who was located changing the baby on a window sill. Three days; three curries. By long-standing tradition we had a curry with Tania on Monday. On Tuesday we thought we’d go for Chinese, but Sarah and family live in a small village where the Chinese doesn’t open on Tuesdays, so we had another curry. On Wednesday, Faith had been reading our blog entries about curry, and made us one. Only another dozen or so and we’ll have stocked up enough to see us through the next couple of years of curry-famine. A friend of ours died this week, I have known Jon since I was 19, he’s a top bloke, we share a reputation for asking the difficult questions. We feel sad for us that he’s not around, but he also knew very starkly the likely progression of his illness, and we’re grateful that he was spared the worst of the potential end-scenarios. Most importantly of all, he knew where he was headed, and I reckon his welcome party is just getting going. “I have run the race, I have kept the faith”. Since last week we’ve been giving presentations to churches in Cranham, Whitstable, and Welling. 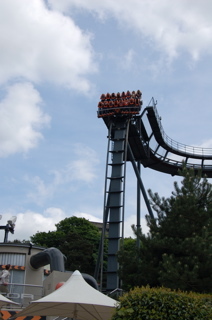 We went to an event with folk at a church in Hatfield, caught up with old friends in Cambridge, dropped in “on spec” to a group in Harlow, and because obviously we hadn’t driven enough miles yet, we fulfilled a longstanding promise to take a young friend to Alton Towers. The motorway network is well into traditional “summer” mode, i.e. filled with traffic cones and contraflow systems, without which the congestion alone would probably still make the experience arduous enough; but my goodness we do have the most fantastic bunch of friends and supporters. Today was a series of joyful little reunions with friends at a drop-in centre in Harlow, and I was struck yet again with the warmth and care, and by so many people just quietly getting on with walking the good deeds that God sets before us. It probably sounds sentimental, but we are really proud to know you guys. There’s something about theme parks. I always think I’m too grown up, and have no intention of mounting anything moving faster than a cable-car. I can maintain this stance without any difficulty until someone persuades me that my presence is necessary to make up a twosome. I ascend as a (relatively) dignified adult convinced I wouldn’t be doing this apart from as a favour for my needy friend, and descend as a fully transformed consumerist adrenalin junkie; “That was fun, now get me a bigger one…”. Joni at eight months old today is too young to be impressed by roller coasters, but he was highly pleased by his first experience of donut. His newest skill learnt this week is blowing kisses. He is very generous and non-discriminatory over whom he bestows his kisses upon. Worthy recipients have included the lady serving in a corner shop, my parents’ dog, and the sheep and lambs in the field we walked the dog through. The Independent newspaper is a fine publication. I read it every day, including online in Argentina. As well as keeping up with UK news, it is useful for monitoring progress of the “UK perspective on the rest of the world”. For a more accurate majority UK perspective I know I should be reading a paper with a wider circulation… but I scrapped that idea on realising that it meant The Sun, or The Mail. “If your concept of world geography was shaped entirely by what you read in the papers and saw on television, you would have no choice but to conclude that America must be about where Ireland is, that France and Germany lie roughly alongside the Azores, that Australia occupies a hot zone somewhere in the region of the Middle East, and that pretty much all the other sovereign states are either mythical, or can only be reached by spaceship”. Bryson, (1995) p32. “This is a third world country with all the problems that come with that.” There’s nothing like an insightful piece of analysis to enable the reader to understand the story… and that is nothing like an insightful piece of analysis, but it was quoted by the BBC, so presumably it was the best elucidation available and at least Mr Calder was able to identify correctly the country he was writing about, which is probably all it takes to put a journalist into the “elite” class when reporting on South America. This leads us on to the South American news story covered last week, i.e. the Bolivian department of Santa Cruz voting for economic autonomy. The story was interpreted in The Independent as “Santa Cruz voting on distancing themselves from Lima“. I rest my case. … income tax and morris dancing. The tax office, the beloved tax office. Martin logged on to the tax office website and thus discovered that he had been re-designated as the owner of one “Saffron Indian Cuisine”. We don’t know where Saffron Indian Cuisine is, which is a shame because we’d like to call in for a meal, since we apparently own the business. Meanwhile we applied to calculate my tax online. My pin-number arrived promptly through the post, to my house, with all the correct details, apart from the small oversight that I had been renamed as a Mr CD Jones. Pro-ID-card campaigners used to suggest that people with nothing to hide would have nothing to fear from ID cards. Clearly this is not true for as long as government computer systems continue to perform these spectacular identity mix-ups with such inevitability. I had forgotten it was May Day today. We were having a quiet pub-lunch with some friends, when a man dressed as a tree appeared at the bar. He was closely followed by the Offley Morris men, complete with bells, flowers, sticks and the ubiquitous handkerchief. Close inspection under the floral hat revealed one suspect to be the father of my friend from childhood. 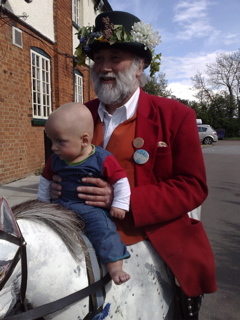 So we swopped family yarns, and Joni rode on his horsey. May Day is a big day in a Morris dancer’s calendar. They start at sunrise and drink… er… I mean dance, in a packed and varied itinerary of locations throughout the day. So they downed a swift pint and performed four dances in the car-park accompanied by accordion, fiddle and a lot of banter, before moving on down the road. I explained to Joni that this fine tradition is part of his heritage, should he choose to accept it. Question is, how am I supposed to explain it for our Argentinean readership?